D.A. 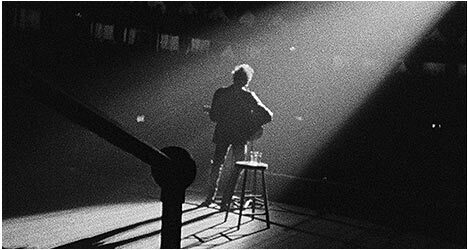 Pennebaker’s legendary documentary Dont Look Back (1967) chronicles Bob Dylan’s last acoustic music tour in England during the spring of 1965. The filmmaker was allowed complete access to the folk singer both on and off stage and captured it all in an intimate, cinema verite style. At the time, Dylan was at the height of his popularity and his powers. At times in this doc, he comes across as arrogant and displays a casual confidence as he conducts countless interviews with the British press. Accompanying him was fellow folk singer Joan Baez (whom he had just completed a tour with) and an entourage of managers and assorted hangers-on. Dont Look Back beings with the famous video for “Subterranean Homesick Blues” with Beat poet Allen Ginsberg in the background as if to signify that he is passing on the counterculture poet mantle to Dylan. We get to see Dylan goofing around in hotel rooms and disrespecting new folk music sensation Donovan (and they meet face-to-face later on in an uncomfortable confrontation). He basically acts like a rebellious young man who knows he’s on top of the world, typifying the arrogance of youth. Yet for all of his arrogance, Dylan is still a brilliant artist and this is on display in the concert footage. However, his stand-offish behavior disappears when he meets with up-and-coming musicians and you see him really listening to what they have to say. Dylan’s arrogance acts almost like a shield in which to deflect the ignorant sycophants and unoriginal questions asked by journalists. He is more than capable of holding his own with journalists asking both smart and dumb questions. There’s a great scene where he has an amusing philosophical conversation with a journalist and self-described “science student” (Terry Ellis, who later co-founded Chrysalis Records). They talk about all kinds of things in a spirited debate that shows off Dylan’s quick wit. Pennebaker even includes uncomfortably candid moments like when a motel manager asks Dylan’s manager, Albert Grossman, to keep the noise down and is verbally abused and threatened by the folk singer’s handler while Dylan looks on sheepishly. Later on, we see Dylan losing his cool in a rare moment as he gets into a heated argument with Donovan over a glass that was thrown into the street. Dylan gets so upset because he doesn’t want to be blamed for someone else getting hurt. He even has the balls to put down Time magazine for not telling the “real truth” and appealing to a certain class of people. He goes on a lengthy tirade about the validity of the magazine to the writer from it. The filmmaker employs a hand-held camera technique that allows him to be right in a moving car or hotel room with Dylan. It creates an intimate atmosphere as it feels like we are right there with the folk singer and not distanced or removed as in more traditional documentaries. It’s amazing to see the kind of sensation Dylan was in England at the time. Crowds mobbed him whenever he’s out in public with teenage girls chasing after his car when he leaves a gig. Dont Look Back is a fascinating snapshot of the folk singer at a crucial moment in his career – before he went electric and pissed off legions of folk music purists. The documentary provides invaluable insight into how Dylan operates, including how his business is run and what he does in-between concerts which strips down the romanticism of being a rock star only to maintain it with scenes of him and Baez toiling around hotel rooms working on songs and enjoying their success. Who wouldn’t want that life? This duality is important to show because you can’t have one without the other. While Dylan concentrates on his music, Grossman deals with the business side of things: organizing concerts, public appearances and interviews. He worries about the money so that Dylan doesn’t have to as it would only serve as a distraction. Don’t Look Back has never looked better than this newly restored transfer, which features a fantastic amount of detail while preserving its 16 mm look. Criterion has included extras on a previous special edition DVD. “Bonus Tracks” features five previous unreleased and uncut audio tracks recorded during Dylan’s ’65 tour in England while filming Dont Look Back. The first disc features a 1999 audio commentary by director D.A. Pennebaker and tour manager Bob Neuwirth. Originally, the doc wasn’t supposed to start with “Subterranean Homesick Blues” and after Pennebaker shot it, he claims that he had no idea what to do with it until he stuck it on the beginning of the film. Neuwirth didn’t want a slick, professional looking doc but something that reflected the times and what Dylan was doing. The two men provide a bit of a backstory to the doc and point out who everyone is in it which is a nice touch. It is good to hear Pennebaker and Neuwirth reminisce about the film and the times it documents. There is an alternate take of “Subterranean Homesick Blues” with Dylan and Ginsberg in a little park near a tree instead of an alleyway. Rounding out this disc are mini-bios on Pennebaker, Dylan and others featured in the doc. “Bob Dylan: 65 Revisited” is a collection of never-before-seen outtakes from the original doc assembled in 2006 by Pennebaker. Those hungry for more of what was in Dont Look Back will enjoy this collection of previously unreleased footage including more concert footage of Dylan in action and a nice bit where he and Baez sing a duet in their hotel room. Also included is an optional commentary track by Pennebaker and Neuwirth. The filmmaker says that he was hesitant about putting this together because he didn’t want to make a sequel. This stuff wasn’t originally considered that important and was cut out but Pennebaker feels that this compilation was significant enough to be resurrected. Also included is an audio excerpt of a 2000 interview with Dylan for the Martin Scorsese doc No Direction Home cut to previous unseen outtakes from Dont Look Back, which is a must-see for Dylan completists. We also get three short films by Pennebaker that are interesting to see how they anticipated what he did on the Dylan doc, especially his interested in musicians as evident in “Lambert & Co.,” which focuses on American Jazz vocalist Dave Lambert as he auditions singers at RCA in 1964. “It Starts with Music” is a new doc examining Pennebaker’s filmmaking style, from his initial attempts to how he picked his subjects, which often came out of his fascination with music. There is a new conversation between Pennebaker and Neuwirth about when they first met – before Dylan’s ’65 tour in New York City – and their collaborations afterwards. There are even more outtakes from the doc on an extra entitled, “Snapshots from the Tour,” which shows more never-before-seen footage from Dylan’s ’65 tour. There is an interview with singer/songwriter Patti Smith who talks about Dylan’s influence and how Neuwirth mentored her early on in her career. Finally, there is a conversation between music critic Greil Marcus and Pennebaker that is a lot of fun.